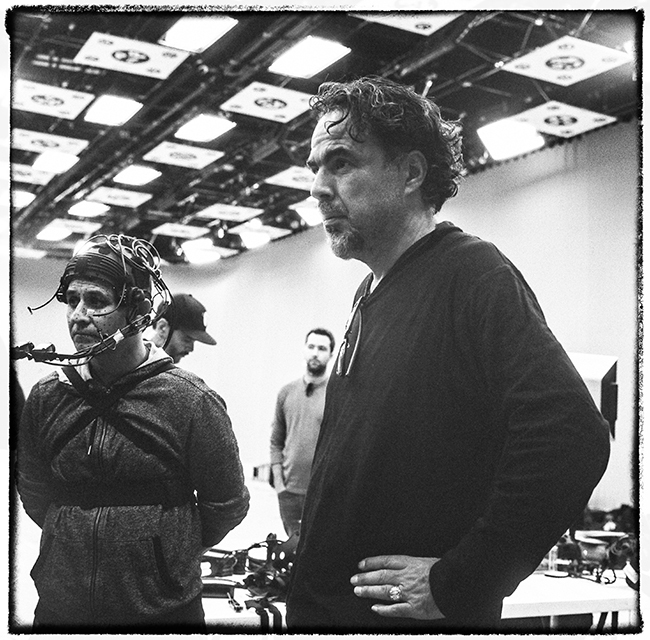 Alejandro G. Iñárritu directing a baker from El Salvador named Yoni. Yoni is dressed in a motion-capture suit and recreating a harrowing moment on his journey. Image courtesy of LACMA. Photo: Chachi Ramirez. Is our attention so lacking in imagination that to consider another’s point of view we have to technologically embody it? Inside Alejandro G. Iñárritu’s Carne Y Arena (2017) virtual reality installation at LACMA, I asked myself this question. For the privileged few able to score tickets to this sold out, single-viewer experience, the exhibition is spectacularly effective. By transforming real-life struggles into a multi-sensory phenomenon, however, the show raises questions about the perceptual distance between museum goer and subject. 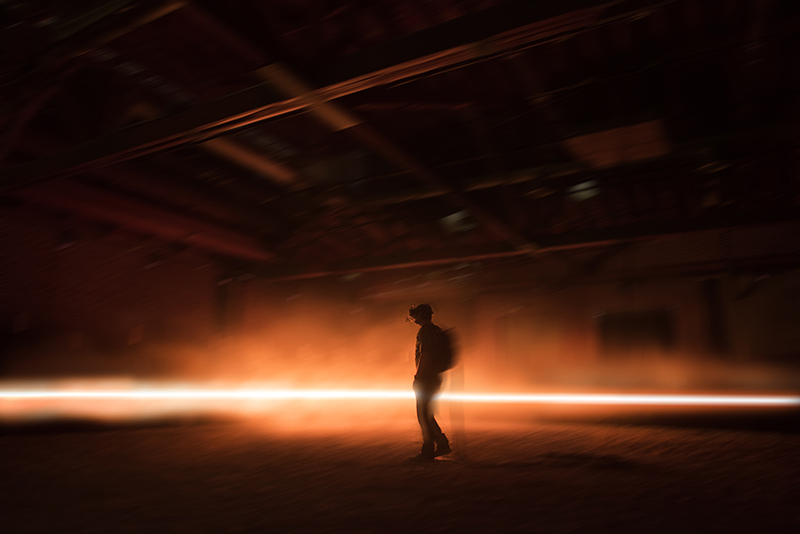 Iñárritu’s six-and-a-half minute VR film simulates a treacherous scene of Mexican and Central American refugees crossing the U.S. border, an experience mediated by industrial fans, freezing temperatures, complex light and sound design, and a labyrinth of rooms monitored by numerous museum attendants. Despite the director’s claim in the press release “to break the dictatorship of the frame…and allow the visitor to go through a direct experience walking in the immigrants’ feet, under their skin, and into their hearts,” the point of view of the exhibition is paradoxically self-oriented. Like the 45 second entry into Yayoi Kusama’s Infinity Room (2013) at The Broad, the novelty of experiencing this high-tech VR production is indicative of other elite cultural experiences marketed to promote exclusivity. In general, VR encourages users to disengage from external reality and, in the case of this exhibition, to walk in and out of the museum dirt-free while simultaneously exiting with the physiological impression of having endured a border crossing and immigrant detention center. While current research demonstrates the therapeutic and empathy-inducing effectiveness of certain VR applications, like simulating war scenes for veterans suffering from PTS, the virtual embodiment of immigrants’ journeys in a museum context presents a moral quagmire. Technological voyeurism is emotionally triggering; trauma translated into spectacle seems inherently wrong. Considering the current and actual threat to refugees’ lives and the geographical proximity of the border, immersive VR feels like an artistic overstatement of a situation directly outside the museum’s walls. 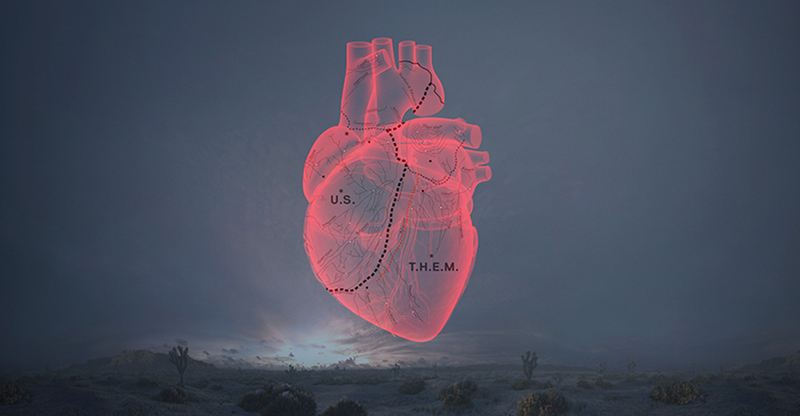 Alejandro G. Iñárritu: Carne Y Arena runs through July 1, 2018 at LACMA (5905 Wilshire Blvd., Los Angeles, CA 90036). User experiencing the art installation. Image courtesy of LACMA. Photo: Emmanuel Lubezki. Design: Neil Kellerhouse. Image courtesy of LACMA.